Plastic is cool. It can bend but be unbreakable. It can be almost weightless, yet tougher than tungsten. You can cover a sandwich, spaceship, house or football field with it—and make it any color you want to dazzle the eye. The one thing you can’t do is get rid of it. Created in numerous forms since the late 1800s, a fully synthetic plastic wasn’t invented until 1907 when phenol was combined with formaldehyde to create Bakelite. Various offshoots of this stuff were used somewhat sparingly for decades, and it wasn’t until the early 1960s that plastic use really caught fire. Plastics were all the rage—you name it and plastic was most likely in it. The problem with plastics sort of slowly snuck up on the world. People began to realize that it didn’t really GO anywhere. It collected in landfills, clogged rivers, formed floating Texas-sized masses in oceans and dramatically ended up wrapped around whales or jammed up sea turtles’ nostrils. By the time people realized that there was an issue with plastic, it had already become a very serious problem. It’s estimated that more than 8.3 billion tons of plastics have been synthesized since the 1950s, the equivalent of roughly a billion elephants. And the curve showing plastic production has rocketed up at an alarming rate in the last two decades. Against this backdrop, Boulder Magazine wondered about the use and disposal of plastics in our community. We went to learn more from the experts at Eco-Cycle, who generously gave us their time to provide the latest info about the current issues and solutions relating to plastics, both locally and globally. Harlin Savage, Eco-Cycle communications director, and Kate Bailey, Eco-Cycle policy and research director, were interviewed by Tom Brock on Oct. 24, 2018, at the Eco-Cycle offices. 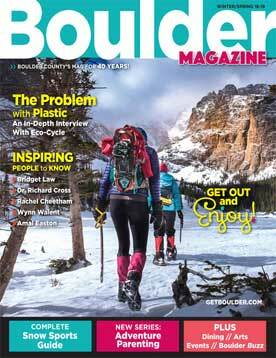 Boulder Magazine: Plastic has only been universally used for about 50 years, but we now seem to be acutely aware that we are inundated with it. What are the key issues, as you see them, related to plastic in the environment? Harlin Savage: At the other end of that, one thing to consider is that all the plastic that we’ve ever created still exists. Plastic is not truly biodegradable. It eventually breaks down in the ocean, or when it’s exposed to the elements, into smaller and smaller pieces, but it never goes away. So the fact that we are continuing to generate hundreds of millions of tons of plastic … that accumulates over time, and that’s why we have a very significant problem right now, so that’s something for people to keep in mind. That plastic item that you bought, it may morph, but it’s never going to go away. It’s never going to completely biodegrade. BMAG: How much plastic waste is generated in Boulder County compared to other cities? 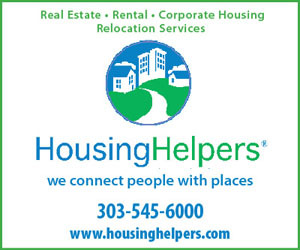 Kate: What we generate locally here in Boulder County is not really any different than what’s generated in other communities across the country, so we’re pretty standard. One thing that’s good to know is Colorado is one of the most wasteful states in the country. We generate a lot more trash than other states. We generate on average, about 8 pounds of trash per person per day, and plastic is a part of that. Plastic is more about volume than weight. 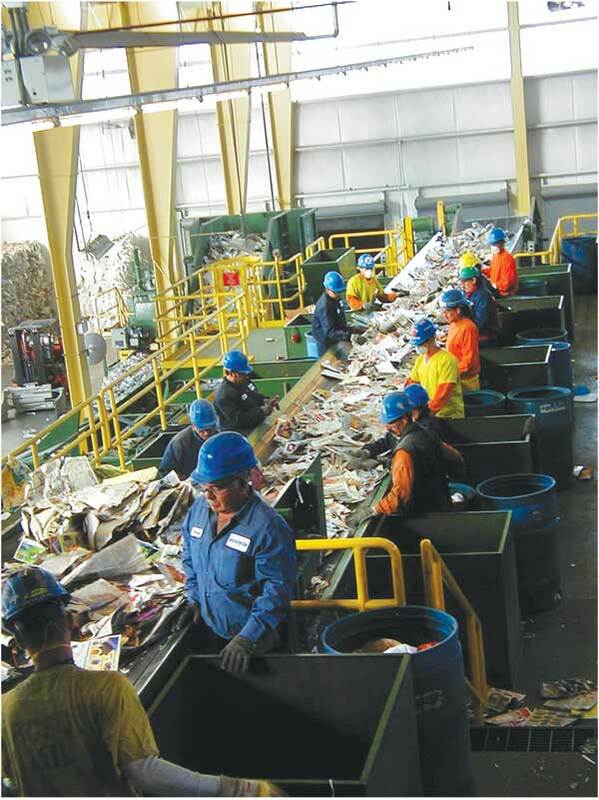 About 40 to 60 percent of our waste comes from businesses and the rest from households. BMAG: What does the plastic recycling process involve? 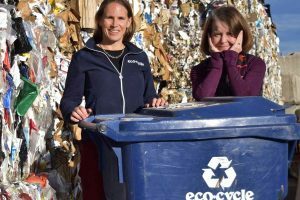 has single-stream recycling and can accept the same plastic bottles, plastic tubs, plastic jars that can be recycled locally, so everyone has access to those same services. 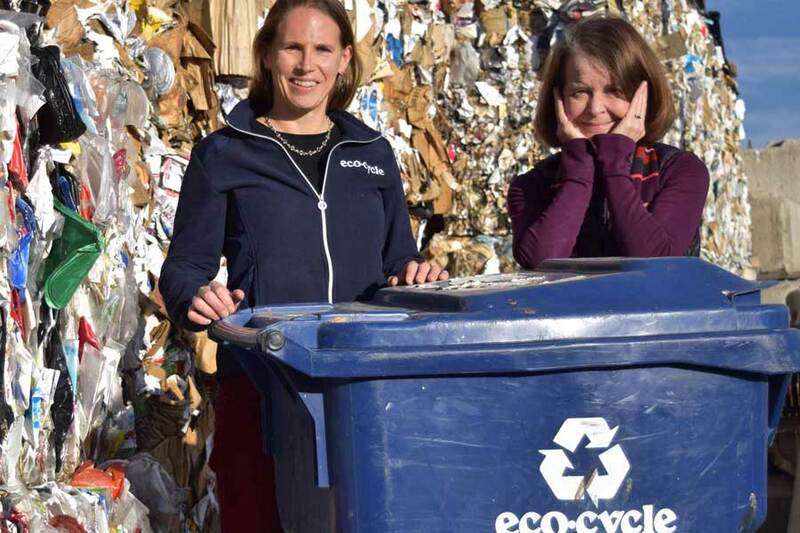 BMAG: How does recycling in Boulder County compare to other Colorado cities? Kate: That’s a great question. We take for granted that we have curbside recycling, curbside composting. Most communities in the country do not. There are only about 200 communities in the country that have curbside compost, so that puts us in a pretty select few, and curbside recycling is widely available across the U.S., but in most communities, you have to ask for it and you have to pay more for it. For example, in some of Colorado’s biggest cities—Aurora, Colorado Springs, Lakewood—curbside recycling is not automatically provided like it is in Boulder. 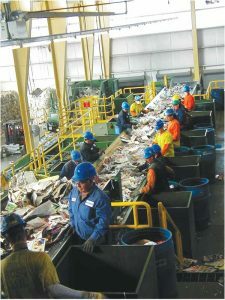 Residents have to pick up the phone, find a trash company, say, “I want recycling. I’m willing to pay a few dollars more,” and then they get it. Studies have found that just providing it automatically next to trash—you get more participation. BMAG: How do you keep up with the huge volume of plastic waste? Kate: I would say the volume of the material is not so much a challenge. The economics are the bigger challenge for us. One of the reasons recycling struggles in Colorado is because we have some of the cheapest landfills in the country. On the Front Range, on average, it costs $20 a ton to send your trash to the landfill. The national average is $50 a ton, so we are significantly cheaper than the national average. In Denmark and the Netherlands, for example, some of their landfill prices are over $200 a ton. Very little gets sent to a landfill at $200 a ton. Harlin: There is a shift that needs to happen in terms of looking at these materials, not as waste, but as valuable resources. Colorado is one of the most wasteful states in the nation. We have a 12 percent recycling rate statewide, and that translates to, you know, we are burying valuable materials—glass, aluminum, cardboard—in landfills every year that are valued at upwards of $250 million, so we’re throwing money away, basically, by landfilling all of these materials. 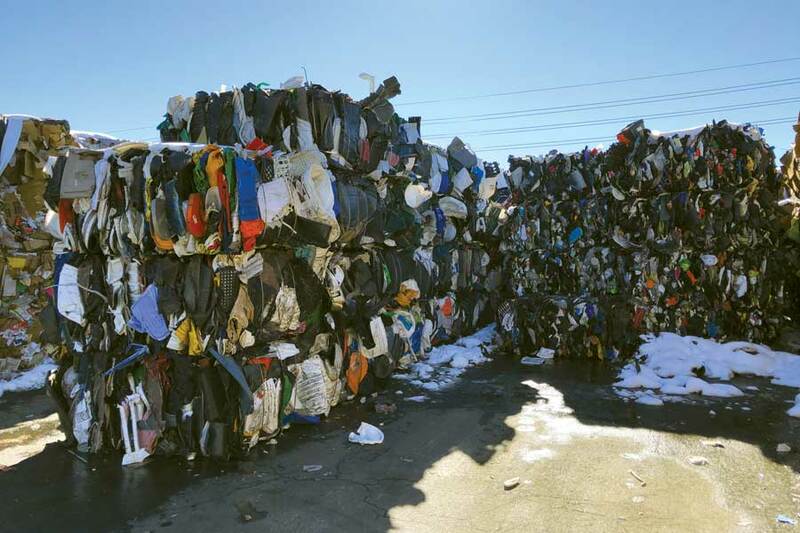 BMAG: How are current market conditions impacting recycling economics? Kate: For many of us at home, recycling is, you know, we put it in the bin and it goes away. We don’t see it. But the reason recycling works is because we’re able to collect those materials and sell them to a company that makes new products out of them. Having a buyer on the other side is fundamental, which is the reason why we take some things and don’t take other things. 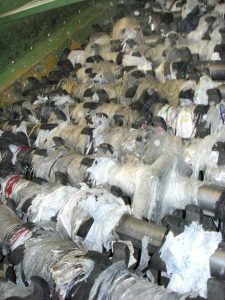 Recycling over the last 10 years or so has really become more global, so your materials might be going as far as China. What we would like to see is more local recycling markets. Coors is a great example: your glass gets recycled into glass bottles right down the road at Coors. And we have a new company coming in called ReWall that’s going to be recycling milk cartons and aseptic cartons, those shelf-stable soup cartons. Eco-Cycle has always tried to prioritize local markets, domestic markets first because we thought it was safer from a business perspective, and because environmentally, we thought it was the right thing to do. BMAG: What types of plastics do you accept? Are some more valuable than others? Kate: Eco-Cycle likes to talk about the shape of the material in terms of plastics recycling. We recycle plastic bottles, plastic tubs, plastic jars and plastic jugs, really focusing on those shapes. That’s not all plastics—we don’t take hoses, we don’t take kiddie pools, we don’t take Barbie dolls, and we get everything plastic thrown at us. Our biggest challenge, the biggest thing we do not want in your recycling bin is plastic bags. They get tangled in our equipment, we cannot recycle them if you give them to us in your recycle bin. If you bring them to the CHaRM (Center for Hard to Recycle Materials), if you bring them to a grocery store, they get recycled. We cannot take them through the single-stream process. BMAG: So plastic grocery bags, clothing bags, baggies, soft plastics—not for you, right? Kate: Yeah, plastic film. They’re actually very recyclable and very valuable. The challenge is they can’t get wet or dirty, so we really have to collect them through a different stream. We have to collect them in a different method, because once they get thrown in the truck with everything else, they’re gonna get dirty. I want to come back to your question: Are some plastics more valuable than others? We’re all familiar with seeing those numbers on the plastics, the one through sevens. We really try to steer people toward number one, number two and number five, as being the most valuable and also the safest for you to be using, in terms of your health impacts, environmental impacts. We’re starting to do some work in really educating people to avoid the number three, the number six and the number seven plastics. A lot of them can be replaced with a more recyclable plastic. The number six is polystyrene, which has a lot of health impacts in its production, so those three, six and seven are really the ones we’re focusing on. Let’s move these to something that’s more recyclable, safer for the environment. Let’s make a better product. BMAG: There are two issues with the bad plastic. You can’t recycle it, and the manufacturing process and materials are more hazardous to health. BMAG: Speaking of banning plastics, Colorado law says you can’t ban plastics. True? Harlin: There is a thing called plastic preemption. In the mid-’90s, as part of a bill that dealt with encouraging state agencies to use more recyclable materials, two sentences were inserted that say that municipalities in Colorado may neither require nor prohibit the use of plastics. That’s the plastic preemption. So, technically, local communities cannot ban plastic products in Colorado. The state could, hence the polystyrene ban I was mentioning earlier. That would be a state-level action. Kate: Meanwhile, across the country, we’re seeing a lot of communities banning disposable plastics. While they’re looking at a ban, they’re also looking at how do we create more opportunity for reuse? How can we reward people who reuse their bags? We’re seeing that a lot around the world as well. The EU has now said all plastics must be recyclable or compostable or reusable by 2030. So unfortunately, meanwhile our hands in Boulder are a little more tied, but there’s certainly a growing global consensus that this is a huge problem. BMAG: Do you have any info on the success of Boulder’s plastic bag fee? Kate: The city reported an almost 70 percent decrease in overall bag use once the fee went into place, so people were clearly not taking bags or bringing their own reusable bags, or some stores switched to cardboard boxes, so we definitely saw that that fee had an immediate and lasting impact on reducing bag use. 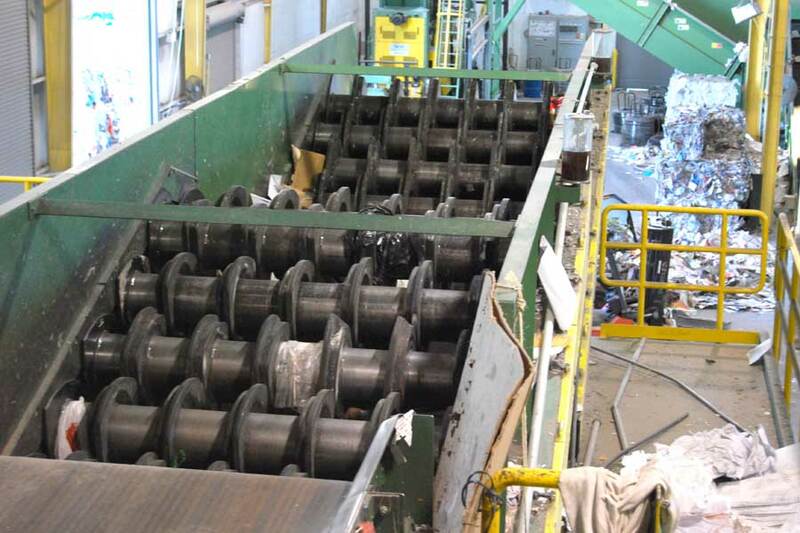 BMAG: What else is new for Eco-Cycle’s plastic recycling? Kate: Guidelines have recently changed. We installed some new equipment at the BCRC, so we were able to expand some of the plastics we are now able to take. We can take five gallon plastic buckets, we can take yogurt tub lids, we can also take the berry, or the clamshell containers, we call them—like the large salad containers. The other question we get a lot from people is about bottle caps. If you have a plastic bottle, the plastic bottle cap should be screwed back on the bottle, and then that gets recycled. Please don’t give us just the cap itself. We’re not able to pull that out. Mixing materials is also a problem. If it’s a glass bottle with a plastic lid, we can’t take those together, but as long as it’s like your soda bottle—plastic bottle, plastic lid—empty it out, screw it back on, and we can recycle that. BMAG: How have market conditions changed what you do with plastics that may or may not be attractive to the marketplace? Kate: That’s a great question. It gets to the point that we’re looking at recycling as the solution to help with plastics, but we’re just responding to all these products that manufacturers are throwing at us. To be honest, of all the plastics ever made, only nine percent have ever been recycled, so we are not able to keep up with demand. We will never be able to recycle all plastics. That should not be the goal. The plastics that you give us in the bin, if they’re what we ask for, they get recycled, 100 percent. We need to be looking at the manufacturers who are making all these products. How are they helping in the recycling process? They need to be buying these products back. We need a place to be able to sell them. BMAG: How does Eco-Cycle encourage a change in how plastics are made and used? Harlin: Eco-Cycle is about building zero-waste communities, and when we talk about zero waste, we tend to focus on downstream solutions to our waste problem, and a downstream solution is recycling. But we really also need to be focusing on upstream—what are we creating in the first place? What are we allowing to be created? 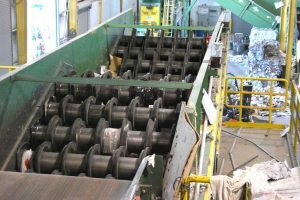 What kinds of materials are manufacturers using? We would argue for significantly greater producer responsibility in the U.S. so that when you’re manufacturing your product, you’re not only looking at does it work as intended? Is it attractive? We would like manufacturers to also be looking at can it be reused? How long does it last? Can it be recycled? Can it be composted? BMAG: To Harlin’s point earlier, plastic doesn’t go anywhere. Do we know how bad it is for our health, or is it too early to tell? Kate: I think it’s a little too early to tell, but there’s a lot of indication that it’s not good. One of the problems is not that we’re ingesting these plastic particles, but what we’re seeing in the ocean is that plastic attracts other chemicals that bond to it, and they’re called persistent pollutants, They’re some of your more dangerous, more toxic chemicals. They’re sort of clinging onto the plastic, and then they’re being introduced into the fish or into our bodies, so it’s not just the plastic particle itself, but all the chemicals that are coming with it. BMAG: So it’s like when a little piece of Styrofoam attracts a bunch of other tiny pieces? Kate: Exactly, we’re watching it move up the food chain in the ocean, and now we’re seeing people ingest it, and we’re still in the early stages of figuring out the research, but we always turn to the precautionary principle, which is basically, an ounce of prevention is worth a pound of cure. If this looks like it’s going to be a problem, let’s start acting before we can be sure. Harlin: And just to add to that, we’re talking a lot about the oceans, and that’s incredibly important, and it’s very visible and prominent right now, but you know, we have these small bits of plastic called microplastics here in Boulder County. You take a shirt that’s made out of polyester and run it through the washer which creates friction pulling plastic microfibers from the clothing. Those plastic fibers eventually end up in the wastewater treatment plant. I just wanted to make the point that we’re here in landlocked Boulder, and yes, we have a crisis with our oceans, but we’re also directly affected by these materials. These microplastics are here as well. It’s everywhere. BMAG: What other issues should we be thinking about? Harlin: Kate mentioned earlier that virtually all plastics are made from oil or natural gas, and the large corporate petrochemical companies, the ExxonMobils of the world, are increasingly getting larger and larger sales and a lot more profit off of what we’re calling unnecessary plastics. The plastic bag was not made because consumers were demanding it. It was made because ExxonMobil’s precursor figured out a way to take natural gas feedstocks and make plastic disposable bags out of them. BMAG: Reports say the new money being invested in new plastics industries is greater than all that has been invested to date. True? Harlin: The Center for International Environmental Law, based in Washington, D.C., has done a series of reports on plastic throughout the entire life cycle. One report examined the corporate leaders and found that they are planning to invest about $164 billion over the next five years or so, to build new or expand existing facilities, some 264 in total. Once that infrastructure is in place, we may have locked in a certain amount of plastic production that we may not even want. BMAG: You mentioned the circular economy model. How does that pertain to plastics? Kate: We’re seeing a lot of global focus on circular economy, whether it’s around plastics or whether it’s around climate. How do we use our resources more sustainably? How do we, in a circular economy, keep them moving through? Instead of cutting down trees to make new paper, how do we recycle that paper and use it over and over again? We’re seeing a lot of great initiatives come out of Europe. How do we incentivize companies to do this? How do we design products that we’re going to buy this back, and use again in manufacturing? A great example is the EU required car manufacturers to take their cars back for recycling. BMW took their car back and tried to dismantle it, and they were like, “Oh, there’s all these different types of plastics and they’re not labeled!” So they redesigned and they simplified, and there are now three types of plastics. They can dismantle the whole car in three hours because they connected the designer with the end process. We’re seeing a lot of movement in that direction. We’ve seen the U.S. Chamber of Commerce embrace circular economy as the future. I would say we’re seeing bright spots everywhere, which is really fun. We’re seeing a lot of ways that you as a consumer, you as a recycler, can reduce your plastic use, so we did a plastic-free challenge at Eco-Cycle, so you can find that on our website. So you learn about what you can do in your own life, and we also encourage people to look at, what’s that next step? What can you do at your work or your school or your church to replace some of these plastics? Then how can you go farther, and how do you talk to your local city council about a plastic bag fee, or helping ban Styrofoam at the state level. So each one of us has an opportunity to create change in our individual life and then ripple out throughout the community and kind of find out that role, and we’re seeing so much momentum globally around all of this. It’s super exciting. BMAG: The U.S. Chamber of Commerce is behind the circular economy model? Wow! Kate: Yeah. Again, they’re looking at the business opportunity. They’re looking at the direction the world is going. The U.S. can be a leader or the U.S. can be a follower. BMAG: To sum up, I’d like to ask you both what you think the most immediate threat is from plastic, and to follow up with how optimistic you are that solutions will be achieved. Harlin: In what time frame? Kate: I feel like we’ve covered the plastics problem, and I feel you have a good understanding of the fact that it’s global. I mean, it’s in our oceans, it’s in our health, it’s in our food, it’s affecting our climate, I mean, as National Geographic put it, this may be more important than climate change. It’s hard-pressed to say that there’s one thing that rises above the rest, yet I’m also optimistic in that we’re talking about this, and we’re having serious conversations at, maybe not in this country at the level we would like, but certainly in other countries at the highest level about how we’re going to move away from this. And it is a global problem, and it is going to need that sort of global action. I find it really encouraging how quickly it’s grabbed people’s attention. I think the discussion and the pace of the discussion gives me hope that we are going to take a really hard look at how we use plastics in general and start to change the direction. Harlin: I would echo that this is a global problem where we have an opportunity to come together to solve it, and it’s not just an environmental problem. It’s a social-justice problem. I mean, you look at communities in Southeast Asia that are basically living in plastic landfills. It’s horrible, but good things are coming out of it. At the global level is this new group called Break Free from Plastics, and I would encourage people to check that out. We have communities in Southeast Asia, for example, that are taking the brunt of the impact. We have groups in the U.S. that are producing a lot of the natural gas and producing a lot of the materials to begin with that are unnecessary and wasteful and problematic and perhaps ending up on these beaches in Southeast Asia. There’s tremendous energy around this. There are thousands of organizations, not just individuals, that are participating in Break Free from Plastics, and Eco-Cycle is part of this effort in the U.S.
BMAG: So, the bad news is there’s a problem. The good news is there are solutions being worked on. Kate: The bad news is it’s a big problem. Harlin: It’s a big big big problem. BMAG: Anything else you’d like to add? Harlin: Human beings have tremendous ingenuity. If people, manufacturers and corporations get the right set of incentives in place, which we don’t have now, at least not in the U.S., we can unleash the creativity to solve this problem. We have everything from people trying to figure out how to use hemp to replace plastics, to researchers at CSU trying to figure out how to take these polymers, these long chains of molecules that make up the plastics and turn them back into their basic elements. 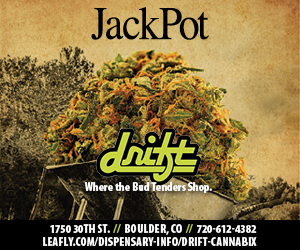 In Boulder, for example, we’ve got people who have started companies so you don’t have to use your Ziploc plastic bag anymore, who are making substitutes that you can store your fruits, vegetables and leftovers in. There are cloths that are made with beeswax and other natural materials. That part is exciting, and it’s very disaggregated; they’re happening organically. People are very committed, and that gives me hope. I think that’s needed when we’re talking about making significant changes in our economies and moving towards a truly circular economy.